At the time of her husband's inauguration, Jacqueline Kennedy was the youngest First Lady since Frances Cleveland. She was beautiful, charming, gifted, and immensely popular. Every woman in America wanted to look like her and her taste in fashion quickly became the national standard. Jacqueline Bouvier was born to a wealthy and social prominent Long Island family. Her education was obtained at the choicest of private schools, including Miss Chapin's School, Miss Porter's School, the Sorbonne, and Vasser. It was while she was working as the Inquiring Photographer for the Washington Times-Herald that she met the dashing young Senator John Kennedy. Their 1953 wedding featured 900 guests and thousands of gate-crashing on-lookers. Although "Jackie," as she was called, professed no particular interest in politics, she quickly became a major asset to her ambitious husband. She traveled around the world as First Lady and impressed many dignitaries with her knowledge of foreign languages. 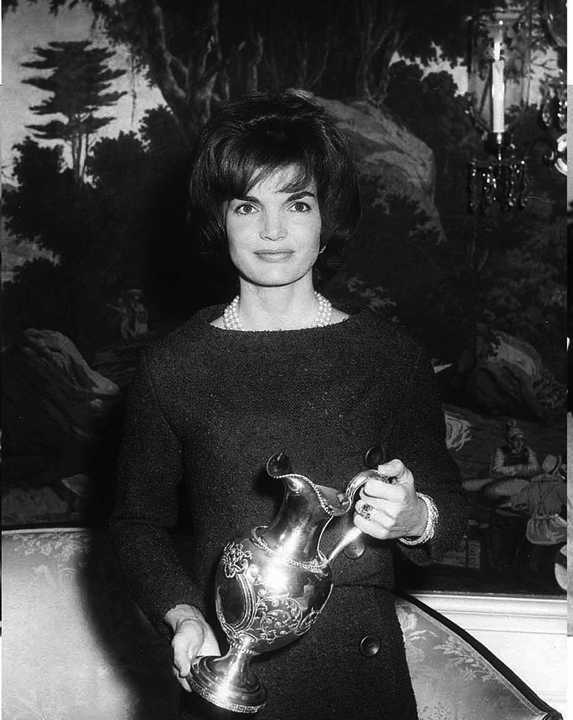 The American public was charmed by the sweet-voiced Jackie who led them on a televised tour of the White House to show off its treasures. As a student of history and an amateur artist, Jackie was determined to restore the Mansion to its 18th and 19th century splendor. She was also interested in ballet, theater, and classical music, scoring a major coup in securing cellist Pablo Casals to perform at the Kennedy White House as he had done years earlier for Theodore and Edith Roosevelt. Above all else, Jacqueline Kennedy was devoted to her children. They were the first youngsters to live in the White House since the rambunctious children of Teddy Roosevelt. Mrs. Kennedy once said, "If you bungle raising your children, I don't think whatever else you do well matters very much." She made sure that her children were shielded from too much public exposure while in the White House. At the same time, she very much wanted them to experience a "normal" childhood, going so far as to start a play school for Caroline on the third floor of the White House. The nation grieved along with the First Family when the Kennedys' third child died shortly after birth in 1963. But there was even greater grief yet to come. On November 22, 1963, President Kennedy was assassinated in Dallas. The nation watched transfixed as the young widow led her family and the world in mourning the fallen president. After leaving the White House, Mrs. Kennedy moved to New York where she led a very private life with her children. In 1968, she married the wealthy Greek shipping magnate, Aristotle Onassis. Eventually, she was widowed once again. But she always maintained her quiet composure in the face of unremitting world scrutiny. In 1994, it was announced that the former First Lady was suffering from lymphoma and was receiving chemotherapy. Unfortunately, the cancer was relentless. Jacqueline Bouvier Kennedy Onassis, symbol of an era, died at her New York home surrounded by her family and friends. She is buried next to President Kennedy at Arlington National Cemetery.